Another new month, and don't they fly? This morning I will be out still chopping away at the debris left from the prunings of my apple and cherry tree. I managed to get rid of a lot of it via the Garden Waste Recycling truck last week. Normally I recycle most stuff back into my garden but this year I am a bit overwhelmed by the amount I have to get rid of. So now I have been snipping the ends of the branches where there are leaves and soft growth, then placing the larger pieces in bags and the three-foot lengths in bundles for the next Garden waste collection in a week's time. My first job today is to mow the part of the lawn that is available to me, then place my prunings over on to the cut grass and complete the rest of the mowing; and all that before the rain comes again late this afternoon. Ta Rah! for now. @Kelejan wrote: ... Ta Rah! for now. "Ta Rah" ... I haven't heard that expression for quite some time. Sounds like you are keeping very busy KJ. Topping up the beds with compost, then planting spinach and kale no later than the weekend. Lettuce by mid month, but that's probably it for May. We'll get some nice days but rarely does it stay warm enough for decent germination. June 1 tends to be the bid planting day for us. Wow, Kelejan....you are my hero! It is cool and blustery here, I haven't even started my super hotties (squash, melons, cukes) and that is late for me. Yea, we've got 4 years experience now and have found that if we plant too early, even if there is no frost per sé, the plants start very very slow and then stall. Its a super fine line though. Start things too late and we run out of summer before maturity. ID, I think that is a Northern English expression, TD, probably from Coronation Street. Sanderson as for being busy and writing about it, perhaps I should compare myself to our Canadian Defence Minister, who puffed up his involvement on some military expedition and has now to apologise for mispeaking? There are so many gardening jobs that need to be done so that I can mange my garden as I get older and my physical output gradually reduces so that I continue to stay in my home. e.g. reducing the lawn area by eliminating all the fiddly bits that are hard to mow. 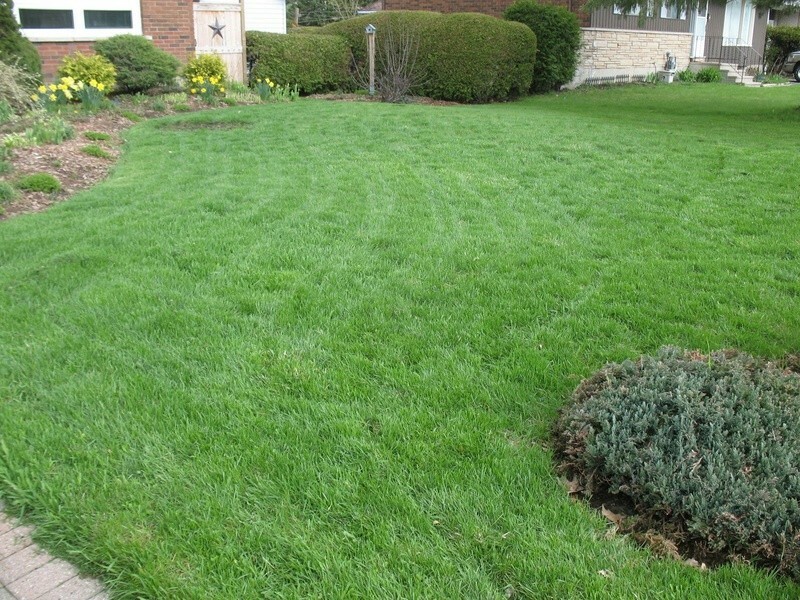 The lawn itself is not problem, it is the edges that I am trying to get into a straight line or a continues curve. It does not help when we seem to be having rain day after day, but today looks as though it will be dry, but then there are other things that need doing, like shopping and a dental appointment. KJ I am familiar with the phrase from where I come from in the Northwest Midlands. We had a break in our rainy weather so I was able to get the lawnmower started and mowed the front lawn. First cutting of the year with many more to come. 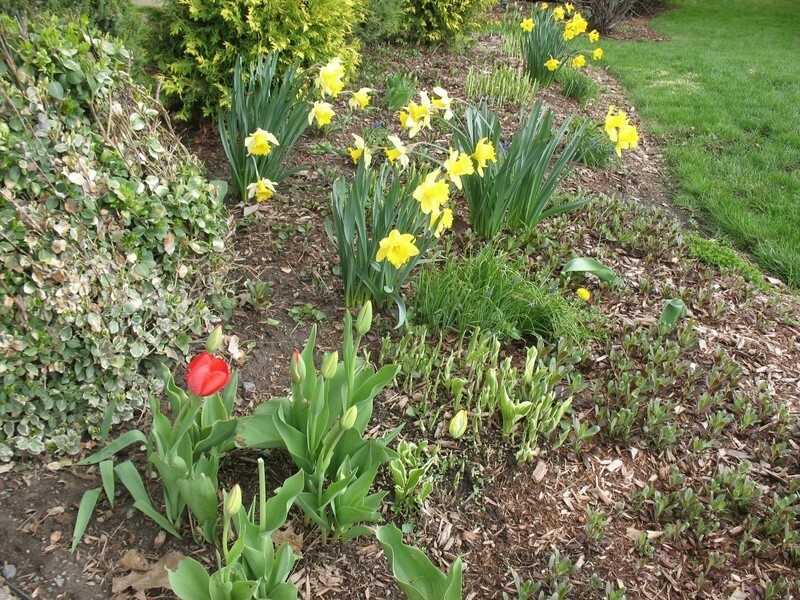 Here is the lawn, a tulip and daffodils and a grape hyacinth. TD - your lawn looks great. Mine is mainly dandelions in the back right now. This year, and for the next couple of years, I'll be able to blame the previous owners. Right now they're propagating faster than I can weed them. Ta-rah.... I know this too, being a Brummy myself. Left the UK when I was 5 so it's been a *cough* long time. Lots of Brits here. I still need to build a rabbit/dog fence. Turns out that my dog likes to run through the dirt. It's not doing great things for my garden. I think that will be this weekend's project. It's rained a lot over the past few days, so I'm hoping to see my peas and carrots start sprouting soon. Jaffa, I expect you do not have a Brummy accent seeing as you were a young child when you left. I had a Brummy penfirend when I was at school. I met him when our Chaplain took a bunch of us to the Lake District and he brought along two of his sons where I first heard that accent and I was fascinated by it. We wrote for a couple of years and then, as is usual with pen-friends we lost touch. It is funny that I think of him as he was then, and I hope, if he ever thinks of me, I am forever young, like him. For myself, as soon as I open my mouth to a stranger, they often ask from which part of England do you come from. TD, isn't it lovely doing that first lawn cut of the year/ I did the roadside lawn just no;, it is about 75ft x twenty feet at a guess, thick in some places and pretty thin in others where the cars run onto to the grass to take the sharp corner opposite my home. In the past I have put logs down to discourage them coming too far over as many drivers take advantage and ruin the nice bits. A couple of years ago a van driver actually did a three-point turn so as not to go on the grass, and I was so surprised that I called his place of work for them to pass on my appreciation. They thought at first that I was calling to complain and I think they we surprised to get a compliment. We now have two days no rain forecast, so I am hoping the get the roadside pruning of the flowerings shrubs done in time for the Garden waste collection. A couple of days ago we had a young bear hanging around all day. I chased him three times but he still came around early yesterday morning so I let him know that I was around today, no sign of him. I am very aware of any animal in my garden so I have my retreat planned at all times. I let the neighbours know and they were all surprised and bears are not usually around in the spring. Your lawn and flowers look amazing TD. Seriously, I think you could easily get a second job as a professional landscaper or a garden photographer. @Mimi2 wrote: Your lawn and flowers look amazing TD. Seriously, I think you could easily get a second job as a professional landscaper or a garden photographer. Mimi, you are much too kind. The photos make the lawn look much better than it really is. Rain, rain, rain. We have had a ton of rain which has caused flooding in some areas. The forecast for the next seven days does not look good either. Out of the seven days only Thursday is expected to be dry. Our regular soil gardens are water logged. I dug a shallow hole in one of the regular soil gardens near the SFG beds. You could literally see the water from the surrounding soil pour into the hole. The other thing I noticed was that the top layer of soil was full of worms. I expect they come up closer to the surface to avoid drowning. Thankfully the SFG raised beds remain in good shape. But honestly the grass had to be mowed today...just gonna rain! Rain and cold this weekend. On the bright side, my grass seed that I spread last week is staying moist. @Jaffa55 wrote: Rain and cold this weekend. On the bright side, my grass seed that I spread last week is staying moist. I'll be putting down grass seed on some bare spots today. I need to get a bunch of other things done outside before the rain returns tonight. Looks like it's going to be wet here until Tuesday. 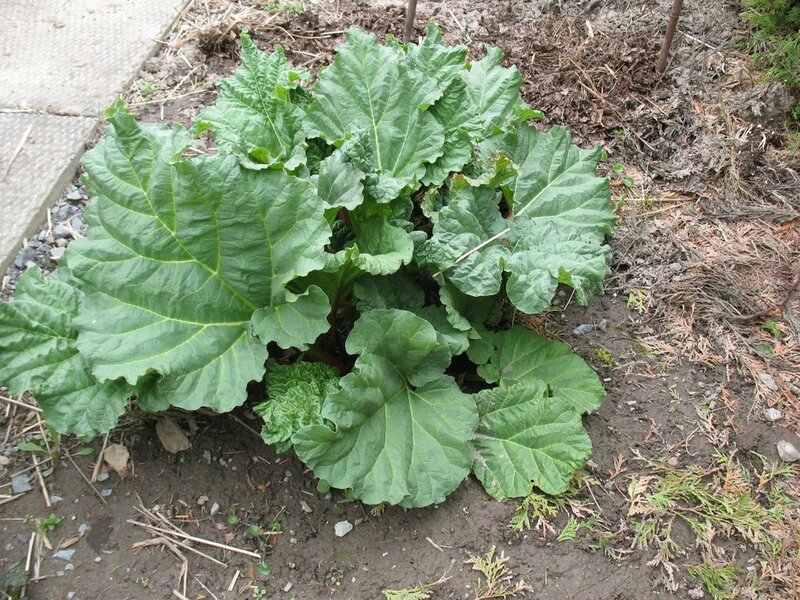 Here is our rhubarb which is growing very nicely. 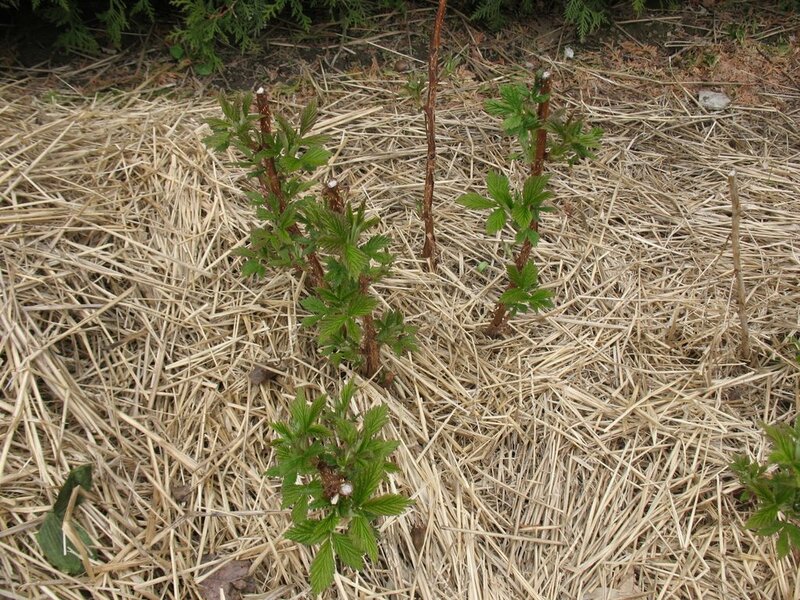 And Mrs TD's raspberry bushes are showing some green. 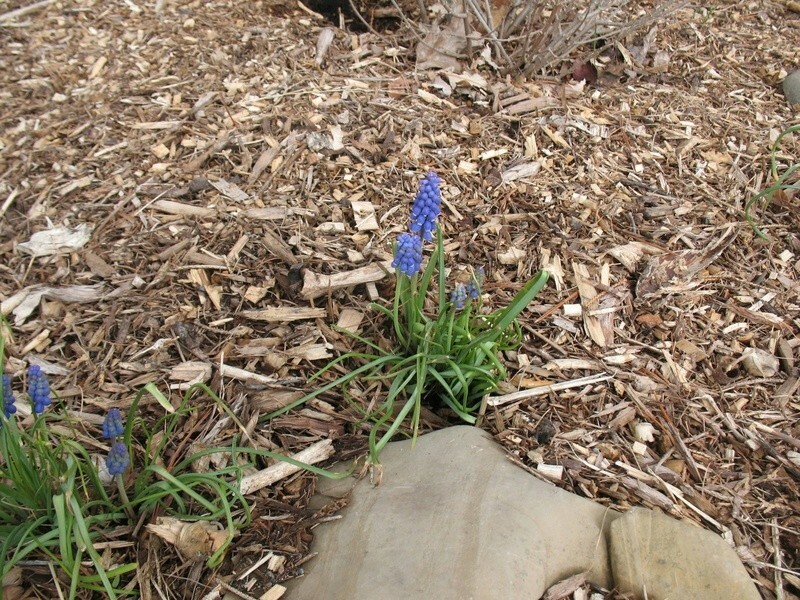 Love this time of the year when things are coming out of winter hibernation and springing to life. TD, just seen the weather forecast for Ottawa: I suggest you do not sow the lawn seed just yes as I am sure it will be washed away. My rhubarb is about half the size of yours but then it was a rooted plant given to me last year and I think it is doing quite well. This year I expect to harvest about four stalks to make a dessert and next year, who knows? Today I spent a couple of happy hours in the garden and managed to actually get some sunlight on my arms and legs. It such a long time since I felt the warmth of the sun on my skin. I did not overdo it, as the temp was about 25C and I made sure that I was not in one position so that only one piece of me got the sun. As soon as I felt a little too warm i moved around. I like being toasted evenly on all sides. Alas, the clouds are beginning to roll in and tomorrow's forecast is rain for two days with 20 to 25 mms each day. Then light at the end of the tunnel with more sunshine. I do hope everyone in Ontario and Quebec get through this trying time. I have never had to deal with floods and I cannot imagine how hard it must be to have everything waterlogged and little chance of drying out soon. Emerald green grass. There are benefits to living in each gardening Region. Such a change from yesterday here in the Southern Interior of B.C. I was in T-shirt and shorts and sometimes in bare feet in my lovely soft green grass and today it has been cool and lots of rain, but not as much as Eastern Canada. Just before dusk my bear visitor arrived so as usual I shouted at him (or her) and he turned around and went back up the hillside. I had hoped he had moved on from his three visits but he is still here. The trouble is of course that during the night he can come to and fro without me bothering him. I don't want him to become an habituated bear as it will only end in his death. When I sit down and watch TV I can catch any movement out my side window be it bear, cat, dog or deer. Tomorrow I am visiting Castlegar's Garden Club sale and I am hoping to find a "Bear Aware" table so that I can order a bright yellow "Bear Aware" sign that I can display whenever I see a bear. I have seen them around near the river and they are very visible. Last month I had eight deer pass through and then found I had lost all my tulips. The sale starts at 8am so that will dovetail nicely with a following coffee break. With all this rain my grass needs cutting again and that I will be able to do as the forecast is dry in two or three days time. During May I like to cut it twice a week, makes it easy. @sanderson wrote: Emerald green grass. There are benefits to living in each gardening Region. Yes, there are. Almost fluorescent. Received the following Personalized Planting Reminder in an email from the Farmer's Almanac. This is what they say for my area but I believe this is based on weather and frost dates from Ogdensburg, New York which is fifty miles south of my location. Today we have here our Garden Club Sale from 8am to 12 noon, then there is the 4th Annual Pass Creek Farm Fair across the Columbia River from downtown from 11am to 4pm. The rain is coming down heavily and looks set to continue for the next few hours. I will go out to the very local Garden Club Sale, dressing up in raincoat, boots and carrying my umbrella to support their efforts. It is so tempting to curl up at home with coffee and a good book, but I make it my mission to support the efforts of local people. I am hoping to get some veggie and annual flower transplants seeing as I did not get around once more in raising my own seedlings. Our rain cannot compare with what is going on elsewhere in Quebec and Ontario and soon to be more eastern parts. In BC we have a missing Fireman in Cache Creek who has been swept away and it does not look good. Mrs TD and I are celebrating our 45th Wedding Anniversary today.